DESCRIPTION: 1-PART is a light gray, permanently highly flexible, self-leveling moisture curing pourable sealer. Its 100% solid soft rubber, has no V.O.C. (volatile organic content), will not melt or shrink, is UV resistant and is resistant to deterioration. New large quick-pour and resealable spout. The conveniend and easy to use 1-Part™ Pourable Sealer is a moisture-cure self-leveling high performance sealer. APPLICATIONS: 1-part is a waterproofing sealant for pipes and odd shapes in exterior or interior environments with horizontal application. Use with Chem Curb pitch pans and other areas needing a deep seal or to fill large thick sections. It's designed for use in warranted ChemCurb penetration seals, and can also be used in non-warranted metal pitch pans. Not suitable for surface traffic locations. 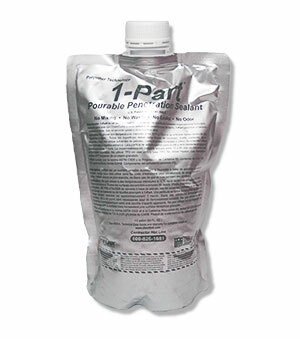 PACKAGING: Supplied in 10.1 oz tubes, 28-oz. cartridges or 1/2 Gallon pouches (four to a carton). Unused sealer pouches can be capped and reused.